We do not wish to put any restrictions on the progeny of our boys. 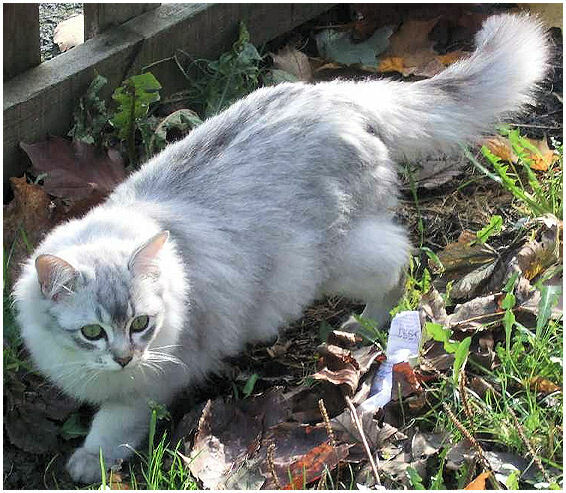 Inbreeding is becoming a serious problem in pedigree cats and we have no wish to add to this. However, Nigel has a 50% chance of carrying the gene for hereditary hypokalemia. Because we have no wish to see any more hypokalemic kittens, we are being very careful about breeding from Nigel. We are breeding on from him briefly for our own purposes as he is essential to our line, and we will not be selling any kittens sired by him for breeding. If anyone else really wants to use him we must insist that all progeny go on the non-active register unless you want to keep one for yourself, and we will want to be convinced you know what you are doing! This is not in any way an attempt to make things difficult for new breeders, or to protect lines, or to limit the gene pool. Geneticists are working on a test for hypokalemia and as soon as there is any way to identify carriers of this, we will be testing and moving on. There are no restrictions on Basil or his progeny - stud fee £200 once he is proven. 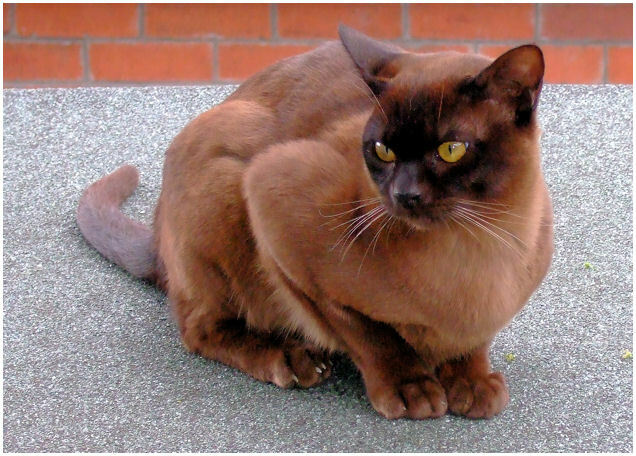 Basil, who is a brown Burmese, has an amazing temperament and loves going to cat shows to meet his admiring public, so much so that he has been known to stow away in a carrier even when he was not entered for the show! Basil is a champion with GCCF, FiFe and TICA. Basil carries chocolate and is consistently siring kittens which inherit his wonderful temperament. He is at open stud with no restrictions on his progeny. Nigel is a black shaded silver Tiffanie. He is third generation which means he cannot be shown as a pedigree in GCCF but he can produce showable offspring; I sometimes show him in FIFe shows where he counts as an Asian Longhair which is a new breed. He carries Burmese restriction and may carry dilute, chocolate, classic pattern or non-silver. He has a very long and heavy coat and is rather cobby in type, so whilst he would be excellentfor bringing coat length back to a line, he would be best used with finer typed Asians. Nigel has now sired his first litter.